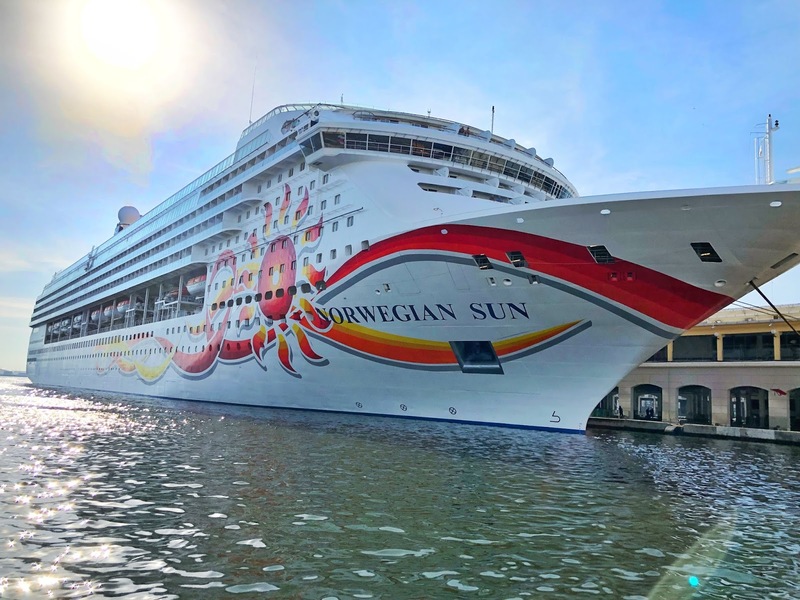 Two weeks ago I had a last minute opportunity to go on my first NCL cruise on the Norwegian Sun. 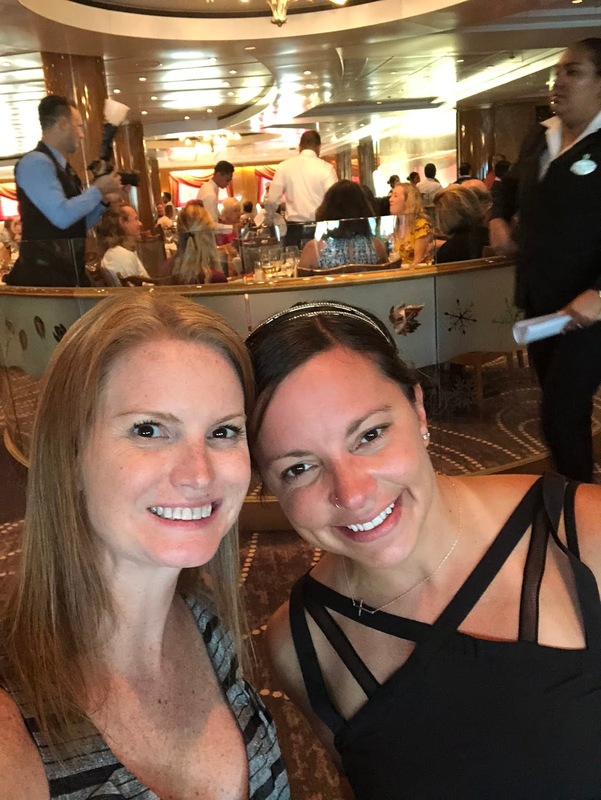 My friend Corey asked me to be her plus one and with a quick shift of scheduling (and a super cool boss), I was able to join her and her family on a last minute cruise. I've been on over 20 cruises combined between Royal & Carnival but the NCL was a first for me. We went on a 5 night cruise out of Port Canaveral and went to Key West, Cuba and Great Stirrup Cay Bahamas. The Norwegian Sun is one of their smaller vessels. It holds 1,936 passengers and 906 crew members. Half the crew to passengers meant amazing customer service and support on the ship. Although the ship was older, it was renovated and I personally liked the smaller ship as it didn't take hours to find your group. 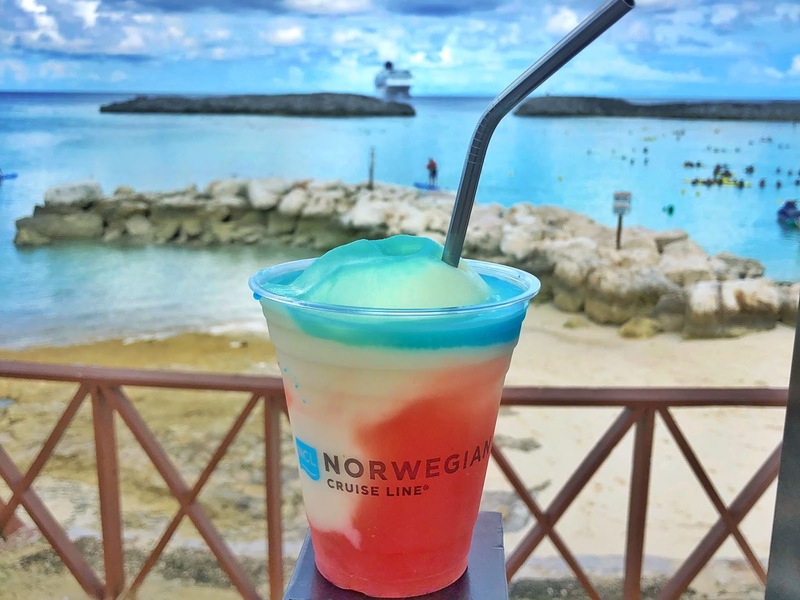 Here are 10 reasons why you should book a Norwegian Cruise Line vacation! 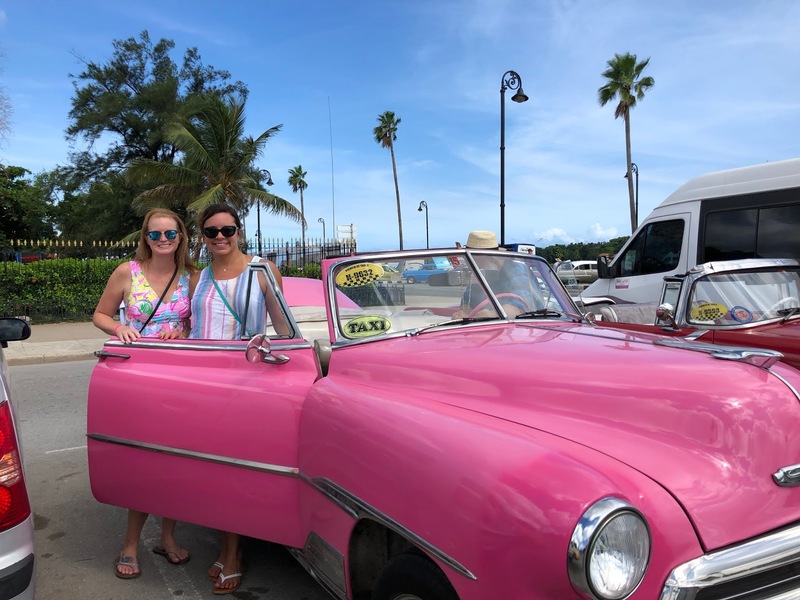 Prior to going on this cruise with Corey, I have always been very intrigued with the variety of free options cruisers get to choose from when booking a NCL. You can choose up to 5 free at sea offers (depending on your cabin type) which include: Free Unlimited Open Bar; Free Shore Excursions; Free Specialty Dining; Free Wifi Friends & Family Sale Free. This is fantastic for cruisers of all type. Personally, I would always select the Free Unlimited Open Bar and Free Specialty Dining as those two things are the packages I typically upgrade to. This method allows you to customize your vacation based on your personal preferences. I always select anytime dining when on a cruise. It allows you to pick and choose when you eat. However, you will likely end up waiting for a table. Not on NCL - all dining is anytime so you don't have the option to select pre-set early or late dining times. We ate nearly every meal in the dining room and I was shocked at how quickly we were sat and offered a glass of wine. Freestyle dining is the way to go! The Norwegian Sun is one of their older and smaller vessels, yet I was pleased to find they had 7 different options for Norwegian Cruise Line specialty dining. The newer/larger ships have even more. We dined at the Moderno Churrascaria, which is a Brazilian Steakhouse. 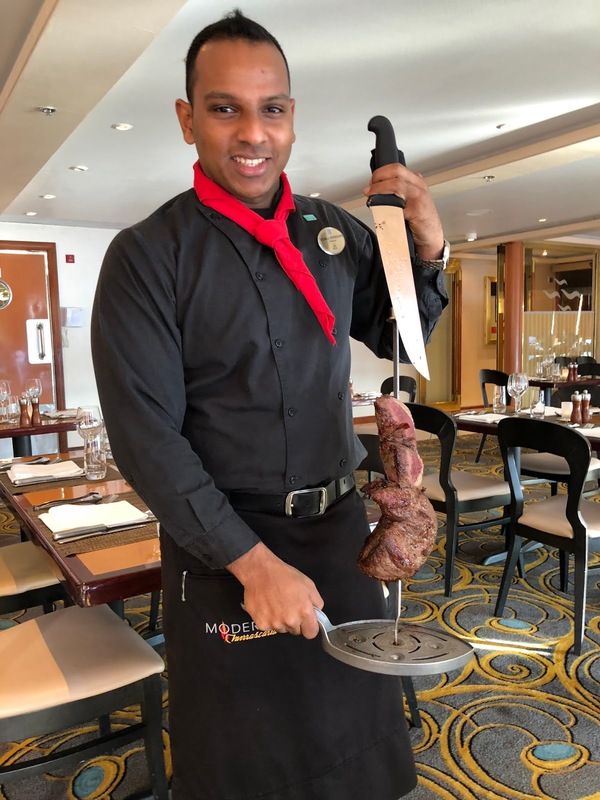 If you're familiar with Texas de Brazil, it was very similar but on a cruise ship. The salad bar was incredible and all meats were carved tableside by Pasadores. Like most Brazilian Steakhouses, it was unlimited. I highly recommend it. Other restaurants I was interested in but didn't have time to try was the high end Mexican restaurant, Los Lobos Cantina and Cagney's Steakhouse, who is known for their truffle fries. NCL was voted for best entertainment at sea by Cruise Critic. We saw a few comedy shows which had the audience howling. Other cruise lines have Broadway productions, including Jersey Boys and Rock of Ages. You can even see a Cirque De Soleil show at sea! I'm not usually one to sit through a production on a cruise ship, but Broadway is a whole different story. We played Deal or No Deal twice and Bingo once. Some ships even have a murder mystery show! The NCL Sun had a wide variety of bars, which were packed at all times (this is what happens when everyone gets the drink package!). We were likely to be found at either the Champagne bar (which was also the specialty martini bar) or the pool bar. Some of the ships feature Howl at the Moon, which was one of my favorite bars back in the day, along with a Fat Cat Jazz Bar. 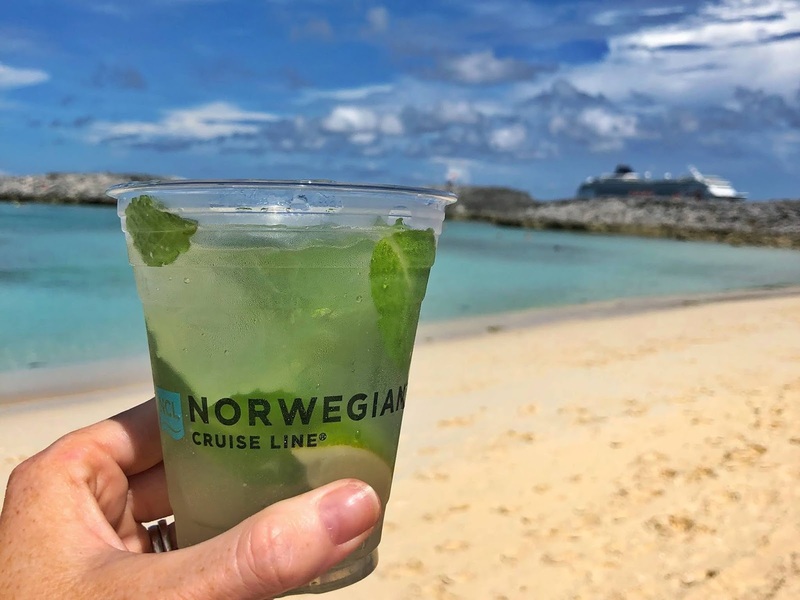 NCL is known for their Mojito's, which I will say were better than the ones we had in Cuba! Where do I start. I fit in perfect with Corey's family. They were all about playing the games on the cruise ship. From trivia to slot tournaments, we did it all. 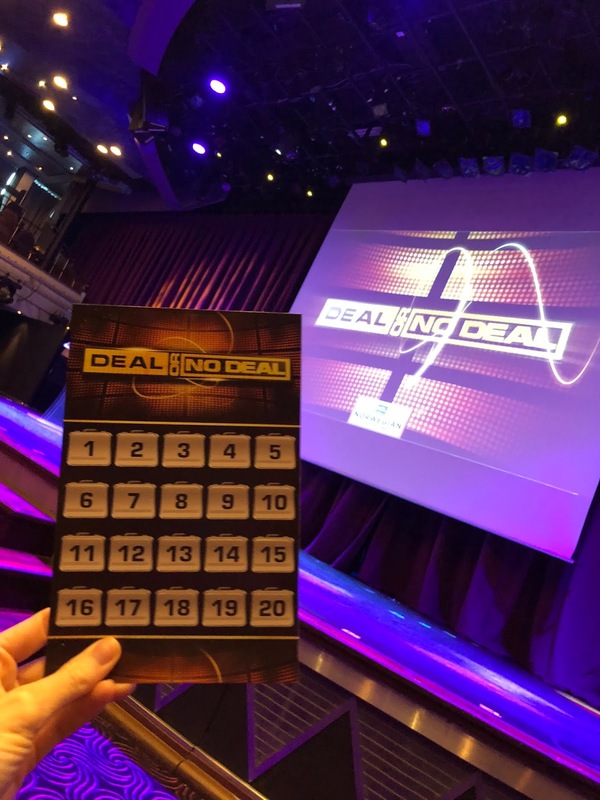 On NCL, you get a activities card, which is signed off by the entertainment team each time you participated (or won) a game. Points were tiered and and the end of the cruise, you turned your card in to trade it for a variety of merchandise. We became that family who were known on the ship for doing every single game. I laughed so hard, my abs hurt. As a "family" we won quite a few contests, including the what's in your bag - which I tied for first place. I had to run around the pool deck, looking for random items. I was so out of my comfort zone and loved every minute of it. 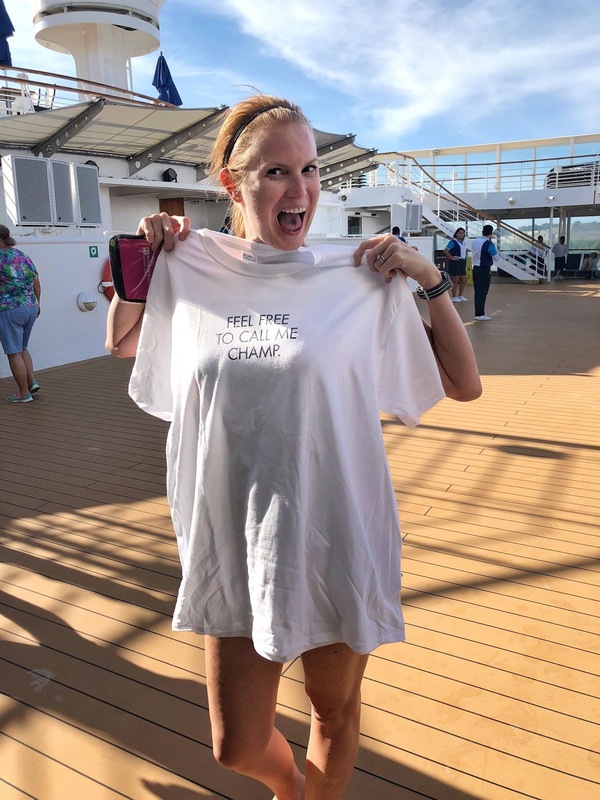 My prize was a t-shirt that said "Feel Free To Call Me Champ". Norwegian Cruise Line has a wide variety of sailings. Basically, if you want to visit a country, it is likely NCL will cruise there. From Asia to Cuba to Australia, they've got you covered. Four years ago when Gabe and I got married, we almost booked a NCL in Italy as part of our honeymoon. For our particular sailing, as mentioned, we visited Key West, Cuba and the Bahamas. 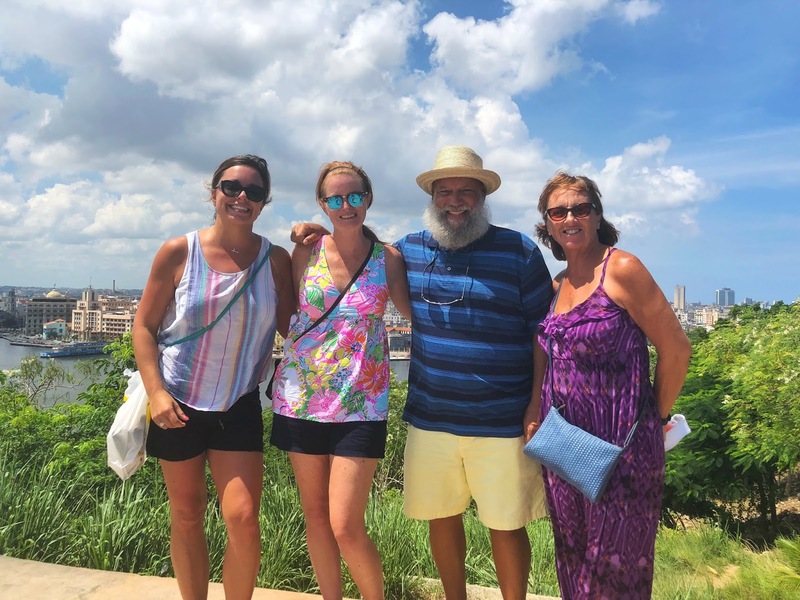 I was very excited to visit Cuba. I will post about our experience soon but I will say this. I am happy I got to go to Cuba, but it wasn't what I imagined. Key West is always a fun port, and I introduced Corey and her family to my two favorite bars (White Tarpon & Irish Kevins). 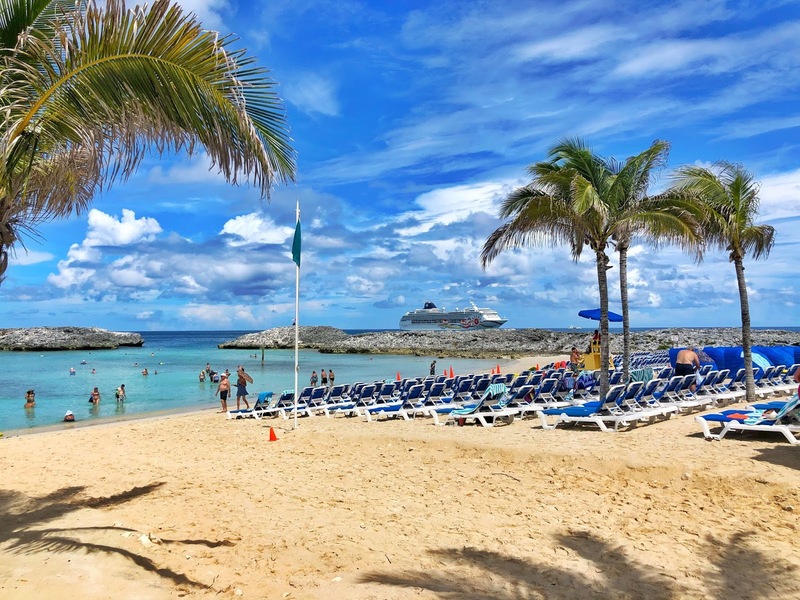 In the Bahamas, we stopped at NCL's huge private island, Great Stirrup Cay. Speaking of Great Stirrup Cay - NCL has a ton of private islands. We visited the island on our last day. Like most cruise lines private islands, Great Stirrup Cay offered a variety of activities, bars and food. We tried out snorkeling and considered going SUP. Since everyone had unlimited drinks, the bars were free (however didn't have as many options as the ship). The island was huge, built to accommodate the newer / larger NCL ships. Being they're double the size of our ship, we had the island pretty much to ourselves. The food options a BBQ including a variety of salads, burgers, chicken, ribs, hot dogs and pizza. They offered vegetarian / vegan options upon request. There is also a brand new complimentary Abaco Taco bar which we tried out. Also, being this is a private island, the Casino did not have to shut down while we were docked. It was a slice of paradise and the perfect way to end our cruise. We did hear that Great Stirrup Cay now offers an excursion to go swimming with pigs. This launched the week after we returned home. This is an ultimate bucket list item of mine and I will be returning to go swimming with piggies. Corey and I shared a Family Balcony Stateroom which was 221 sq ft. It had a King bed that converted into two twins and a pull out sleeper sofa. The room would hold 4 people and had 2 sets of dressers, a mini fridge and a closet with storage shelves. I never once felt cramped. The balcony was spacious, but we sadly didn't spend too much time out there. You can see my video walk-thru. 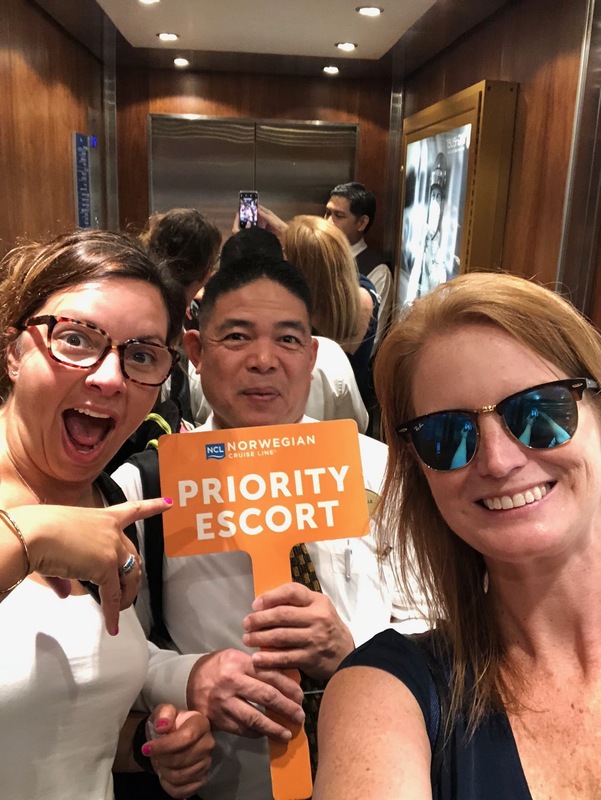 I was very impressed with Customer Service on the Norwegian Sun. We had VIP Embarkation and Disembarkation, which allowed us to get private entry and exit on the ship. From the restaurant staff to the entertainment crew, everyone was above and beyond. Overall, I was very impressed with NCL. I would absolutely go on another cruise with them. It was a great time, we laughed so hard that I didn't have to do any ab workout this month (I think they still hurt 2 weeks later). Have you ever been on an NCL cruise?